Well, the good news is that it floats and generally works well. Very smooth pedaling action, very stable and quite comfortable. The less than good news is that it performed much slower than expectations which means I have more work to do. Stefan messaged me yesterday that the ice is now melted at the reservoir and the docks are now in, so I finished up the last details of the boat and my buddy Greg B and I headed out to the Glenmore Reservoir with the boat on the roof of the Suburban. Compared to WiTHiN, this new boat is very easy to haul around. The hull weighs only 19.5 lbs. With all the hardware, seat and frames, etc I think it weighs in at around 40 lbs. The outrigger floats bolt onto a 1″ square aluminum arm that is U-bolted to the seat frame. The water is VERY cold. A few days ago it was frozen, so I wasn’t going to take any chances with safety. I strapped a paddle on the deck in case my drive failed, and had two-way radio communication with Greg. The emergency phone for the patrol boat is right there at the dock, and the patrol boat was out on the water, so if something did happen and I lost my drive and the paddle wasn’t working, or went for an unplanned swim, the patrol boat wouldn’t have been far away. 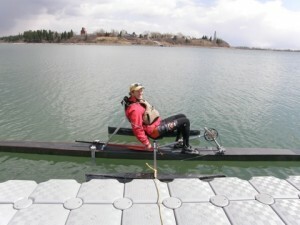 At first, I found it quite difficult to balance without falling over onto one or the other outrigger. According to the design, when I reach a cruising speed of around 10 to 11 kph, I can balance on the main hull with the two outriggers lightly skimming on the water. The outrigger level is adjustable with the U-bolts and I found that if they were two high, then I would flop from one side over to the other, so I had to lower them quite far which was creating additional drag. Low speed expectations were for a cadence of 75, wattage output of 89 watts, and resulting speed of 10 km/hr. Actual wattage at 75 rpm was 100 watts and 8.8 km/hr (and that was WITH the wind). This is FAR slower than it should be and points to excessive drag as being the problem. 1. The outrigger positions need to be adjusted. I notice in the photos that the attitude of the floats is nose-up and they really need to be level. I also need to ensure that they are both pointed directly forward and this isn’t something that I measured previously, so they could be off. 2. Rick thinks that because my seat position is higher, I might require a wider stance for the floats to make it easier to balance on the main hull. I am going to add 2 feet of length to the outrigger arms to extend that moment arm. 3. My rudder is WAY too loose in it’s tube. The carbon tube is 7/16″ ID and the aluminum steering rod is 3/8″ diameter. Manny is making me a plastic bushing to make the fit tighter. The rudder was vibrating in the tube quite a bit and also because the fit was so loose, the rudder was flapping back and fourth a lot. I found it very difficult to hold the rudder steady with my two steering lines. This flapping back and fourth was probably creating quite a bit of drag. 4. I have not faired the rudder with micro yet. The rudder is a 1/4″ aluminum plate welded to a 3/8″ diameter aluminum tube. I grinded down the plate to form the trailing edge of a NACA0020 airfoil (photos below), but have not yet filled the weld gaps with fairing compound. 5. The U-joint that I am using on the drive shaft is the back-up U joint and I think it is creating quite a bit of drag due to the fat flange on it. I have another u-joint that is being repaired by Manny right now that I will exchange for this one. This will make a small difference. 6. To test other components to make sure they are working properly, I have a spare prop from WiTHiN that I could mount on this boat to make sure that the prop is working as designed. I think it is because the resistance I’m getting at rpm is close to design specs and point to additional drag. I also have a second SRM that I will swap out to double check that I am getting the right measurements for power. I welded a 1/4″ aluminum plate to my 3/8″ aluminum rudder rod, then ground it down to approximate a NACA0020 aerofoil. The rudder is controlled with two lines running to a couple of eye bolts that I welded to the a collar. Would it be possible to use an airfoil design? Given that one can reach speeds up to 22kmh that way, you could take almost 2 hrs off to rest. have the prop supported by the drive shaft. The drive shaft would go out the back of the craft just above the water line. All you would have in the water is the straight drive shaft and the prop. I still like the paddle wheel/ floats design I did years ago. when I needed to turn I would just lean to let one the paddle wheel dig in more. I don't see anything wrong with a slightly nose-up attitude to the outriggers, especially if they pivot a bit when they begin to float. It seems to me they will drag less in planing than in displacement mode. I wonder if you prop pitch or gearing is high enough – that isn't a very big prop – perhaps your problem is thrust as opposed to drag.